You may have noticed I didn’t post last week. The week completely got away from me…I was so busy setting up our SoCal CZT Round Up (read: cleaning the shop) that I really had no time, and by the time I did, it was already Sunday! When Diva posted this weeks challenge (#349) for the new tangle from Zentangle HQ called Rumpus, I had already started another piece I am working on for a demo-type class for the San Diego Book Arts Guild. I am using blank coasters to tangle on (with gel pens, not Microns) to use as covers for some yet to be determined book form. The timing is pretty short, so I thought I would use a simple-yet impactful grid tangle. I came up with Fife, one of my favorites, in a rather wonky grid. While I was working my way through it, I thought…gee…this looks like the Flower of Life pattern I am constantly drawing with my compass. And so I decided to look into it, and wouldn’t you know…Fife is an abbreviation of Flower of Life! Fast forward to Rumpus now…and I’ll be darned if it isn’t the same concept. A free form Flower of Life! I still have to think about the book form I am going to use, so I’ll post that when I figure it out. I was at the UCSD campus for a study I was participating in, around the Engineering Department, and saw this amazingly huge rock teddy bear. It made me think about the enormity of things sometimes. Tasks have seemed daunting lately. As I clean and sort and file and get things ready for closing the shop, I feel a little overwhelmed. I felt that way when I was trying to come up with a class schedule for February. For 2.5 years, I have been trying all kinds of days and times and concepts to put classes on the schedule, and if I am lucky I get about 5-6 students a month, spread out over 2-3 scheduled classes. There is simply no way of knowing what times work best for people. So I decided to try something new. You pick the time that is right for you, what class you want to do, and if I have it available, we are a go! Still working out some details of how to word it on the web site, and how to block off my calendar for when I am out of town, but I think this is going to be much less stressful for all of us. Individual, private lessons will be slightly more, but bring me a party of 2 or more and I’ll keep my original prices in tact. We have the next one planned for March 3, from 10-3, still at my place. We will be looking into other locations for future gatherings, so if you are a CZT in the SoCal area, make sure you are in our FaceBook Group to get the updates. Finally, I did remember to photo the other Never Ending Card I did! These are just so much fun to make! Life is a continuous cycle. I’ve learned this in a lot more ways than I ever thought I could. Some things go on and on, and some are only here for a while. 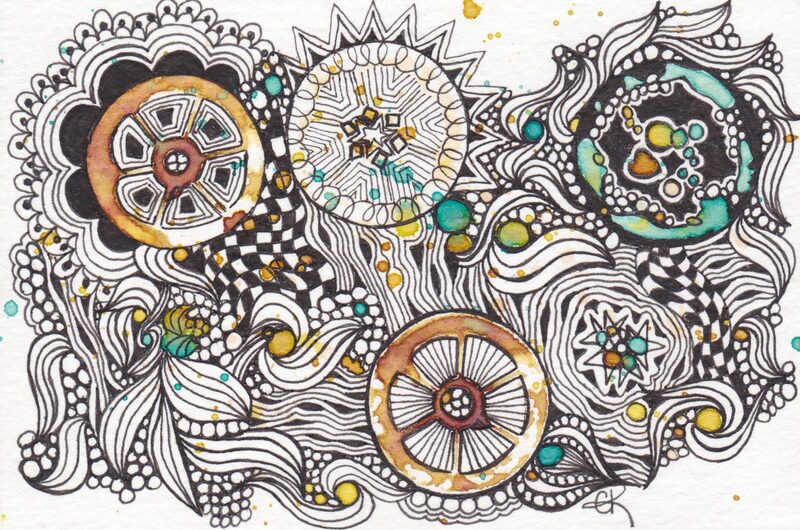 Speaking of beginnings…I am really looking forward to hosting the Southern California Zentangle Teachers on the 27th. I have a really fun project for us, and I can’t wait to see what everyone comes up with on this…sneak peek of Peeking Hearts! I’ve been meditating on my sewing machine this past week, working on a special gift. Sewing and quilting is another one of those things that has been a constant in my life, and I know I can always come back to it when I need it. Lots of progress has been made, and I am rather pleased with the cheery nature of this one! I’ve been working diligently on getting some things wrapped up, framed and priced out, too, for what is in the ending stage. I am closing the shop May 31. This has been a difficult decision, and not one I took easily. I am a pretty introverted person and I have never been good at being in the mix of things (I thought I could change that, but alas, it just made me more stressed.) Taking this action feels like a huge weight has been lifted from me, and I can breath again! But, never fear, there is an ongoing thing or two that will remain. I will continue to have the online store, and I will continue to teach classes, both at my home and a variety of other locations. I do love sharing what I know with you all, and will continue to do that, through my blog. What that means, in the meantime, is a HUGE SALE. I don’t feel like moving everything, so starting now, everything is 10% off. Use the discount code FEB10 in the online store. This is limited to stock on hand, and I am working diligently to make sure that all the inventory is up to date. Even the art on the walls, and most of the furniture is going. (And no, my paper cabinet is not on the auction block…lol.) There are some great deals to be had, keeping in mind I never had anything listed at full price to begin with! While this may seem like an end, I feel like it just the beginning of a new chapter! Happy January from Southern California!